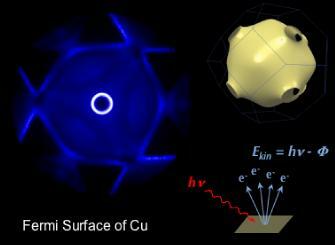 We are interested in the electronic properties of complex materials. Most notable among these are transition metal oxides where strong electron correlations lead to intriguing properties such as unconventional superconductivity, interaction induced metal-insulator transitions and quantum critical phenomena. Increasingly, we also work towards manipulating the subtle many-body quantum states of correlated electron systems through a targeted surface preparation suitable to create low-dimensional electron liquids that do not exist in bulk crystals. The aim of our work is to relate important macroscopic properties of new materials to their microscopic electronic properties and to advance our fundamental understanding of the latter. To this end we use angle resolved photoemission (ARPES) to probe the momentum space structure of electronic excitations on or near the Fermi surface. The example on the left shows how coherent Fermi liquid like quasiparticle states emerge in the layered oxide Sr2RhO4 as the excitation energy is reduced and eventually approaches the chemical potential. An ARPES experiment measures the energy-momentum distribution of photoemitted electrons. This provides a direct image of the quasiparticle band structure of a material and gives detailed information on the propagation of electrons in the full interacting many-body system, making ARPES uniquely powerful for probing the low-energy excitations that define the electronic properties of materials. In our lab at the University of Geneva, we use intense narrow-bandwidth UV lasers for photo excitation, which enables us to perform ARPES experiments with a sub-meV resolution matching the energy scales of quantum many-body states that only exist at temperatures of a few Kelvin.